Do you want to make money? Are you looking for suitable affiliate programs? Do you know that Apple also offers affiliate program? If not, then read this about iTunes Affiliate program, and start making handsome money from your blog. 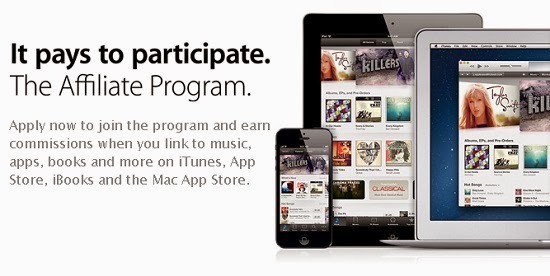 iTunes Affiliate program is free to join and open for all. It usually take five days to get approval. Add your blog link to get approval. Without blog or websites, your application will be rejected. Once you get approval then you can login to Apple affiliate dashboard. Click on Tools and you will see different options to create affiliate links. You can use any of the method listed below to monetize your tech blog. It is highly recommended for tech blogs which have link to the Apple product or app store. You just need to add a code to your blog to will automatically convert them into affiliate links. This saves you from manually creating affiliate links for future posts. This also helps to boost revenue. You create an RSS link to include list of products. Place this Widget in your blog sidebar. If you want to generate an affiliate link for an individual product, then you should use link maker. You can create affiliate links in bulk. This could be useful as it allow you to create a widget for a single app, and embed on your blog. App makers and Developers can take advantage of search API. Cookie period is 24 hours. You get commission of 7%. Cash out after 90 days. Links to Apple Online Store products do not earn commissions. Links to iTunes Gifts are eligible for affiliate commission. If you are on WordPress platform, I recommend you to use iTunes Shortcode plugin. This allows you to add app details in an interactive way to get more clicks and sales. It also supports QR code to increase the downloads. This plugin cost only $14. If you have any question, feel free to ask me, don`t forget to like us on fb and subscribe our newsletter to get free updates.